How to Plan a CPR Party! Learning CPR: Who knew that saving a life could be so much fun? The thought of your child in a life threatening situation is scary. Having the knowledge and know-how to help them creates a sense of comfort. It's important for any parent to know how to help their child should any situation arise that would require CPR, and you'll be better off knowing how to perform it. "It's important for parents to know how to do CPR and relief of choking on their children because seconds count," says Heather Zimmerman, AHA BLS Instructor/Owner of ENLIVEN CPR and First Aid Training. "The first few minutes of an emergency can be the difference between living or dying for some one that is in cardiac arrest or choking for that matter." Find a local CPR instructor that can come to your house (or chosen location). Maybe you can even go to the instructors class location. You may need to schedule a class far in advance. Pick a date and time, of course, and send out invites via email or text. No fancy card needed. Prepare a spot in your home where everyone can have a seat on the floor (most likely your living room floor). Have a little pillow for each party guest to sit on their knees. Simple snacks and drinks, too! The class can go over an hour long. If you have a toddler, chances are you already know that anything can happen at any moment. They're quick, you know! 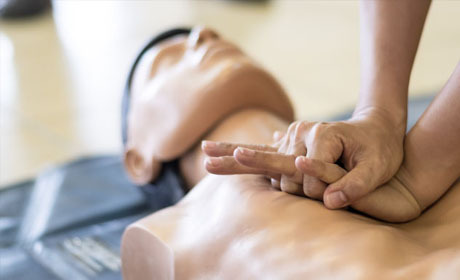 But, do you know when you should perform CPR? "A few situations that a parent might need to perform CPR on a child could be if a child has drowned, suffocated in a crib due to many blankets or toys, a child that has accidentally gotten into a poison or even for a child that may have been born with a heart defect," says Zimmerman. The first thing any parent should do first is to remember to stay calm! It's hard to do when it's your child in need of help, but you can do it. Before you even try to perform CPR, there are certain things to look for. Zimmerman says to look and see if the child is unresponsive (not moving, blinking, moaning or groaning) and not breathing. If you see this, Zimmerman says start CPR immediately. Don't worry about your child's age or size. You'll learn in a class how to perform the task safely on all sizes. "CPR can be performed on ANY AGE," says Zimmerman. "Some parents opt to take these classes before taking their new born baby home and I highly recommend this. Injury is unlikely to an infant or a child that CPR is being performed on." She says that with an infant, you'll learn the technique that uses just two fingers instead of both hands. Otherwise, it's much the same for both infant and adult. Zimmerman adds that it's important to also dictate to others what to do to help. If you ask for help, you're wasting time waiting for someone to jump at the option. Tell someone to call 9-1-1 so you can perform CPR without having to dial the number yourself. CPR is an important skill all parents should know. "I would love to see more parents and mom groups host a CPR party," adds Zimmerman. "The knowledge you gain from a class like this is empowering and helps you know what to do in a situation where it's needed."